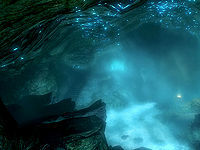 Darkwater Pass is a cave near Darkwater Crossing home to Falmer and chaurus. It is a dimly lit cave system, with a lot of Nordic architecture and urns throughout. For its size, it contains a large number of leveled Falmer, most of which are within hearing of each other, leading to some challenging fights. To locate this cave, leave Darkwater Crossing via the bridge heading south, on the far side take the road towards Fort Amol to the west and shortly before reaching the next bridge the path is on your left, marked by a pile of rocks. At the top the path forks with the left-hand fork leading to the cave and the right-hand fork eventually leading to Ivarstead. The entrance is marked by a statue with a lit brazier on top and a pair of iron doors flanked by Falmer totems, leading into the cave system. The entrance is right by a giant waterfall, along Darkwater River, on the shore of a pool formed by the waterfall. As soon as you enter you are in a narrow partially flooded tunnel heading roughly north. There is a mist or fog in the air making visibility even worse. Use of Detect Life or the Aura Whisper dragon shout are very useful in this cave system. After a short distance the tunnel turns to the west, with an urn and an unlocked chest at the turning. The tunnel opens out into a cave with the ground rising to the right, towards a Falmer hive that conceals a Falmer. Ahead is a stone bridge and platform, similar to those found in Nordic ruins. Crossing the bridge you will see a large cavern ahead, partially flooded, with a leveled Falmer wandering near a Falmer tent with another Falmer inside. In the distance there is a waterfall falling down the far wall of the cavern and several varieties of fish swimming in the water below the falls. To the north is another tunnel. Next to the waterfall is an unlocked Falmer chest and it is possible to climb the left side of the cave to reach a lit brazier with a random healing potion beside it (good mountain climbing skills required). On the north wall of the cave, to the left of the tunnel is a silver ore vein and on the ground in front of it is an iron ore vein. As you enter the tunnel to the north, the ceiling becomes vaulted with pillars supporting it every few paces; there are three leveled chaurus in hiding ready to ambush you behind the pillars. There are several chaurus egg sacs in this area and also throughout the rest of the cave system. Behind the area where they were waiting is another area with several burial urns, an urn and an apprentice-locked wooden chest. The path continues to the north, up a flight of wide stairs. At the top the tunnel turns to the west again and climbs more stairs. At the top you enter a room with a large trap door in the floor under which Derkeethus will be trapped during Extracting an Argonian—(see bugs). There are doorways to the west and south here. To the south you can hear and see a Falmer wandering about. Take care as there are two Falmer hives in the same room, both of which conceal leveled Falmer. The room is circular and the walls have indented shelves all around. In two of these is a random poison and in another is a leveled potion of the warrior. There is an arcane enchanter at the rear of the room with a copy of the Enchanting skill book Catalogue of Weapon Enchantments and a random aversion to shock poison. Finally, behind the enchanter is an unlocked Falmer chest. To the right of where you entered the room with the trap door is an alcove with a lever that opens a hidden door, in the next alcove around is a random healing potion and a septim on the floor and the next houses an urn. To the left of the doorway to the west is a burial urn. To reach Derkeethus, pull the lever to open the hidden door, behind which you will find a wooden spiral staircase; at the bottom are an unlocked wooden chest and a short corridor leading to a locked gate with a small circular room beyond. There is another chest in the room under the trap door, along with two more burial urns. There are also a few loose chaurus eggs and another burial urn along the corridor. In one of the two burial urns in the circular room where Derkeethus is caged is a Darkwater Pit Key, which will open the cage, but oddly, you have to open the cage to reach the urn with the key. The path to the west climbs a wooden spiraling ramp with several glowing mushrooms growing on the central pillar. The room at the top has stairs ahead, with a balcony along the rear of the room. There is a Falmer standing opposite where you enter to the right of a clearly trapped corridor. You can see a claw trap hinged above the doorway. To the right of the stairs is a lever which triggers both the claw you can see and a second claw hinged on the ground. There is a burial urn near where the Falmer stands and a tripwire in the doorway, another trigger for the claw traps. To the south, there is a doorway leading into a narrow corridor heading up stairs. On your right is an alcove containing two urns, one of which is broken. There are two random healing potions beside the urns. By a lit brazier the corridor turns to the west and continues to climb. Near the top it turns north then almost immediately back to the west. Ahead is another cavern. There are several leveled Falmer in and near this cavern including one concealed in a hive. There is a flight of stairs descending against the west wall, with another flight ascending from the bottom of these. At the top is a leveled Falmer who is patrolling the top of those stairs. From the top of those stairs, it is a short drop to access the lower of the two doorways at the rear of the room. Dropping down into the water and entering the doorway, take the first turn on the left and then immediately left again to find a stone table with an unlocked wooden chest and two burial urns. In front is a small waterfall dropping into a pool to the left of the stairs before dropping over the large waterfall to the east into the first large cavern. To the left of this waterfall is a Falmer hive on the wall with a concealed Falmer inside. Opposite this is a bank sloping up from the water to the rear of the cavern. There is another leveled Falmer on this path. At the rear of the room you will see two doorways with wooden planking walls to the left of them; there is another Falmer standing behind these. Near the top of the ramp, you pass another claw on the right wall with the tripwire a few paces past it, at head height. Beyond this point the architecture is decidedly Nordic. The tunnel climbs a few more stairs and then turns to the west again and then back on itself to the north. This is where the Falmer that was behind the wooden planking is standing, unless you have already dealt with him. The path passes the wooden wall seen from the other side; at the end is a large metal bowl with a chaurus egg sac growing in it. There is also a loose chaurus egg on the floor and two more inside the bowl. The path turns back to the south, and stairs lead up to iron doors that allow you to exit the cave system. 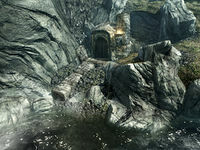 Being a Falmer-inhabited cave, Darkwater Pass may be challenging if you are low-level. In the water just outside the exit about 10 meters out and to the right, there is a skeleton with a random weapon, helmet, shield and boots all lying around him, who appears to have been murdered as he is tied to a stone block. Only the lower entrance to Darkwater Pass appears on your map, not the exit. Derkeethus may occasionally decide to follow you to the door but refuse to exit. Reloading older save points do not seem to fix this issue. A workaround for this problem is to go outside the cave and use the console and type prid 0001B08D and moveto player and then talk to him, this will finish the quest. Another solution to this problem is to push him as close to the door as possible, then exit. He should follow you outside. If you are a vampire seeking shelter from sunlight, do not use Darkwater Pass. It is still flagged as an outdoor area even though it appears to be an indoor area. This bug is fixed by version 1.7.7.6 of the Official Skyrim Patch. This page was last modified on 14 April 2019, at 03:49.